I made these Sweet Potato Muffins for the first time last summer when I started experimenting with vegan baking and somehow I got it right. I baked them a couple of weeks ago with a few changes in the recipe and they were a total disaster! And now for the third time I went back to my original recipe and yay, absolutely perfect!!! It always surprises me when a recipe works out for the first time, but sometimes they just do and I am really excited to share this one with you! 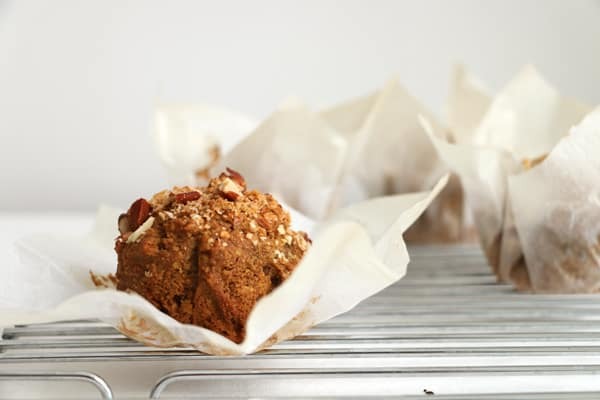 These muffins are just perfect; moist, full of texture and flavour with a little sweetness. The sweet potato and ginger work beautifully together in this recipe and add structure as it contains no eggs. 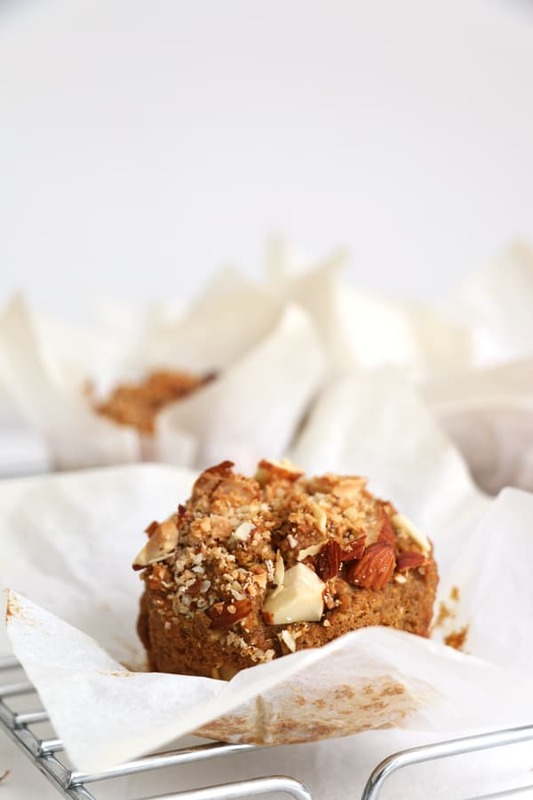 You can whisk these vegan muffins by hand in no time as there is no creaming necessary like in more traditional recipes. That’s really why I love vegan baking, for the simplicity. Root vegetables in cake recipes are great as they add sweetness and moisture to the batter and it’s easier to reduce the amount of sugar. I have used rapadura sugar in this recipe, it’s a great unrefined alternative to a refined sugar and better value compared to coconut sugar which would be another great choice. Do experiment with alternative sweeteners as they are a healthier option and also add different flavour to the recipes. Line 12 hole cupcake tin with cupcake size cases. I have used 6" squares cut from baking paper. 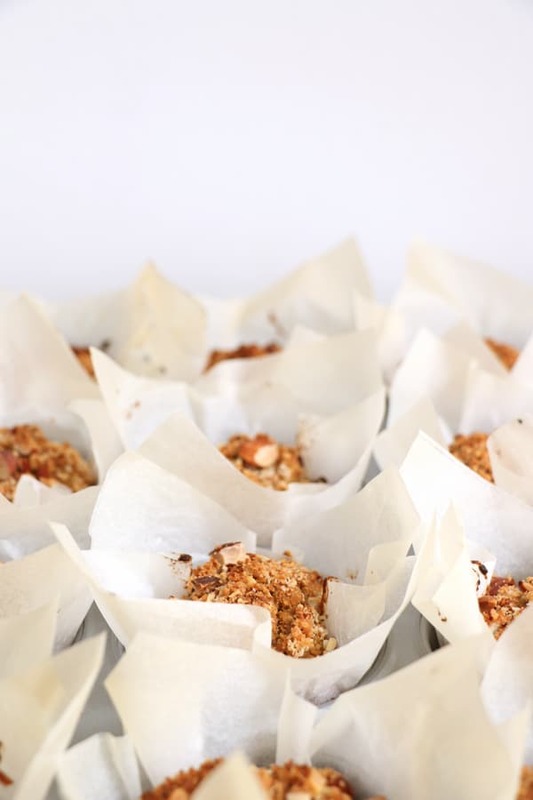 In a small bowl mix chopped almonds with coconut for the topping and set aside. In a large bowl whisk together spelt flour, rapadura sugar, desiccated coconut, baking powder, bicarbonate of soda, cinnamon and salt. Add the grated sweet potato and ginger to the dry mixture and mix well together. In a different bowl whisk together olive oil, coconut milk, apple cider vinegar and vanilla. Add to the dry mix and stir together until well combined. 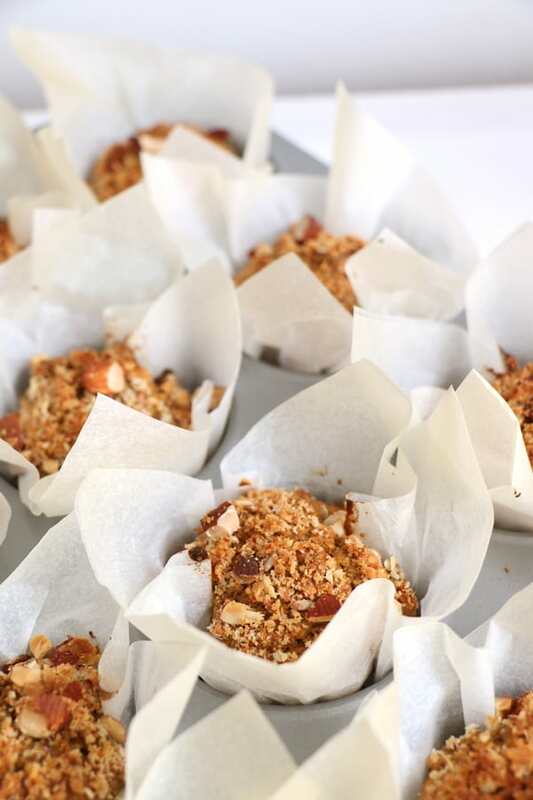 Spoon the mixture into your prepared cases and top with the almond coconut mix. Bake for about 25 to 30 min or until a cocktail stick comes out clean. Remove from the oven once ready, leave to cool down for 15 min before moving onto a wire rack. 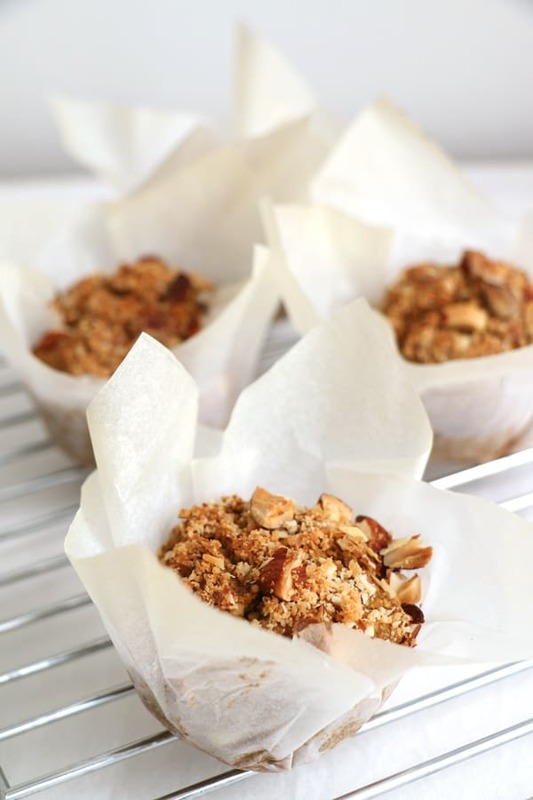 These muffins sounds delicious and so healthy!! I love muffins but usually somebody else has baked them!! I am not much of a baker as you can tell….but I would love to learn. I will start by giving this a go. These look marvelous. I am grain free and am wondering if I can try to substitute coconut or almond flour in some of your recipes. I realize they will be more crumbly. I am really excited to have found your site. 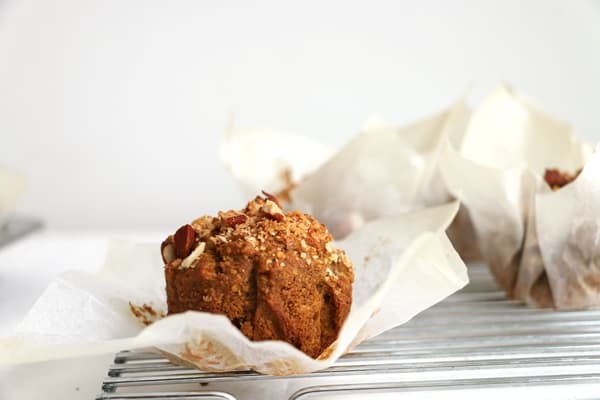 I love that you use savory ingredients in some of your muffin recipes. Thank you! I’m so glad I found this but… I’m still,trying to figure out the whole vegan baking science. 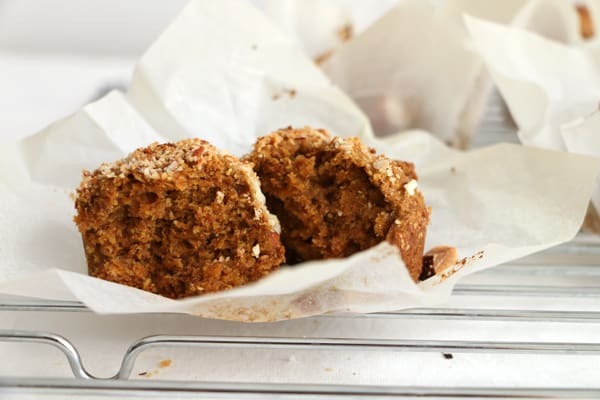 I came across a very similar recipe to yours, only I substituted coconut flour (precisely because I wanted to adapt the recipe to be eggless) with half almond flour and half spelt flour. I used flaxseed eggs instead of real eggs. The muffins pooped up beautifully because of the baking soda but then collapsed as soon as imoped the oven door and I could not get them to bake through. They were, as you experienced a total disaster! Would love any insight you have into the science of vegan baking and what you think might have gone wrong. Thanks! Hi Chris, baking soda wouldn’t be enough to rise them. You will have to use a combination of baking soda and apple cider vinegar at least. Flax eggs are not like real eggs, they need more help. I always mix baking soda, apple cider vinegar and baking powder to make sure my cakes rise and bake well. I’ve tested it in many recipes now and it works for me without a fail. Let me know if you need any more help.